Going up from five in previous years because 2015 was pretty crazy, and by the end of the spring season I already had way more than five shows I wanted to write about. Hopefully, unlike my other big anime writing project last year, this one will actually get finished! First let's look at a few honorable mentions. Five beloved slice of life series received followup seasons this year, and although I don't have any real faults with Hello! Kiniro Mosaic, Working!! !, or Gochuumon wa Usagi Desu ka? ?, they didn't quite make the list. Ahh, I wish we had a few of these slice of life shows for this season, where there are literally ZERO cgdct sol moe shows. ZERO. Sore ga Seiyuu was also very nice, although the wavering between idol, slice of life, and "behind the scenes" type genres made it a bit jarring at times. Nowhere near as bad as Kantai Collection, which had exactly one great episode (the curry one) and then eleven episodes of weirdly inconsistent emotional tenor and lame fight scenes. So much wasted potential. On the other hand, the much lambasted DanMachi I found a pleasant surprise, in that it was more than just lol hestia. It wasn't flawless by any stretch, but it was a fun romp that made me curious about the series' world, which is about all I want from fantasy stories. Special shoutouts to Wakaba Girl and the legendary Teekyuu, they prolly woulda been here if I didn't decide this list was only for full length shows. For the purposes of attending a cram school in Tokyo, rambunctious Kirin stays one night a week with the demure Ryou, who lives alone since her grandmother's passing. The show follows their domestic life on these visits, as they bond over cooking and eating. It, uh, sounds like something I'd write in one of those "pitch an anime!" threads on /a/, right? But no, this is an actual show, they actually did this! And I shouldn't just say "they" - Shaft did this! Shaft! In between the madness of Mekakucity Actors, and the money-printing machine that is Nisekoi, they decided to do a slice of life cooking show! Why? Because they love us! Although I of course treasure the blossoming friendship between the girls, its the food that gets the spotlight here. Each episode features at least eating sequence, where the girls describe at length the qualities of the food, intercut with shots of the food being consumed that cost Shaft approximately a million dollars a second. It's excessive to the point that the show itself jokes about it, but it succeeds - they make the food look really really good. For me, this show kickstarted an almighty love of inari sushi that's lasted for almost a year, a desire beautiful in that it can actually be realized. None of the featured recipes exceed the budget or cooking skill of the average viewer, and the message that, rather than the expertise or ingredient quality, the feelings behind the dish are what makes the flavor make the pleasures of the show accessible, despite their lavish depiction. The message is thus one of finding richness in the everyday, a wonderful moe feeling. It also has the best next episode preview music ever. This is, uhh... a show about hyperintelligent bears at war with humans. The humans have erected barriers to keep out the bears, but some bears have gotten in, disguised as humans, and started eating people. A high school is devastated by these killings, not knowing that bears are lurking among them. The high school also has... some bizarre system of exclusion where they vote to ostracize one classmate at a time? There's also... a prophecy from the goddess of bears? A lily court where misbehaving bears fight for their right to eat humans? Oh oh, and this is important: almost every character is a girl in love with some other girls, and the show repeatedly conflates "eat", i.e. to consume, with a more sexual reading. All with character designs by yuri icon Morishima Akiko, she of the legendary Hanjuku Joshi, and directed by the mad Kunihiko Ikuhara, he of Penguindrum and Utena. Is this like... what I'd post in a "pitch an anime!" thread if I lost my mind? It's Ikuni's attempt to make a yuri story out of this, so it goes without saying that almost nothing makes any sense at any point. Attempts to enjoy this as a straightforward yuri story, the blossoming of the lily etc etc, as I myself was inclined to, are constantly undercut with tragic twists that you scramble to grasp even one facet of. The overall aesthetic of the show reflects this strange depersonalized distance, giving us beautiful but twisted angular landscapes, somewhere between dystopian-Monogatari and cyberpunk-magical girl. Everything operates in this uneasy mode, where you feel a danger beyond your comprehension is always lurking. It's sorta like... David Lynch noir. That isn't to say it's total nonsense, though. The plot constantly pushes the limit of your understanding, constantly giving you moments of "oh, so that's why" and then "but wait, what does that mean?". You still find yourself rooting for characters and happy resolutions, even if you can't quite understand how they would come about. And Ikuni rewards these desires on two fronts, by accompanying moments of revelation with awesome action sequences, catchy auditory motifs (the "gao gao!" has remained my ringtone, despite all common sense), and stunning visuals. It's still so easy to get caught up in the pace of this world, no matter how distant and confusing it becomes. And plus yuri so I contractually have to love it. In 2013, amidst what now seems like it may have been the peak of the moe-slice of life boom, Non Non Biyori stood out from a crowd of similar competitors with its deep rural setting and matching naturalistic focus. Sure, cute girls doing cute outdoorsy things doesn't really seem that different from cute girls doing cute indoorsy things, but the setting afforded them many unique opportunities. Unlike typical high school based shows, which can only look at a tiny subset of the school's hundreds of students, we're able to see the entirety of the one-room schoolhouse, and all the diversity it entails. This sense extends into the greater world, as we have a sense of being able to fully appreciate every aspect of their tiny community. 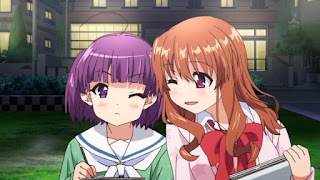 Second seasons of slice of life shows often flounder when trying to escalate the scale of the first run, but Repeat wisely works off their specific strengths and characters without making grand gestures of meaning. That is, in the episode showing Renge's first day at school, or the excellent flashback "curry incident" episode, operate through the viewers' understanding of the significance and sentimentality, instead of trying to force some objective "excitement". Moreover, the confidence they gained in the appeal of the laid-back rural mode allowed them to go even further in deliberate unexcitement, with long sequences devoted to simply appreciating contentedness in nature. Not that the show is boring, of course... these moments are perfectly balanced with some of the year's funniest moments in anime. Working off well established characters, scenarios like Komari's encounter with the teru teru bozu or Natsumi and Hikage's dango mishaps hit that sweet spot between writing themselves and going way too far. There's a sense of comfortableness with the characters, where they know audiences can both laugh at their misfortunes and share in their joy, and thus the show opens up to greater breadth in subject matter and depth in significance. It is a comfort that matches the viewer's. Also, this show gave us the miracle that is CHILDISH HOTARU and deserves a spot for that alone. Okay okay if you haven't heard of this show I highly suggest you go watch all of episode one before you read any more of this. Just trust me. You might want to stop, you might think this is just another SoL show, but trust. Okay, done? You back? Well, I'll just confirm that this is indeed what you think it is. Four girls hanging out in high school, having fun with school activities, with their... dog. And they live in the school. Because there's been a zombie apocalypse and it's the only safe place left. Ah. Yes. Now, I've never been a big fan of zombie fiction. I'm not a horror fan to begin with and zombie plots specifically seem... weirdly sociopathic and uncaring? Like what is the appeal in mowing down swathes of ex-humans? I have a lot to say about the subject but now isn't the time, 'cause this isn't typical zombie fiction. There's a focus on the powerlessness of the characters, of the desperation they face daily, and the severe mental anguish of the situation. The show's non-chronological ordering doubles down on the brutality of the loss, continually shocking you as the contrast between pre- and post-outbreak becomes disturbingly clear. Now, I'm sure this isn't actually unique within zombie fiction, I'm sure people could point me to dozens of texts with similar sensibilities. But it isn't that alone that makes this show special, that makes me truly care. 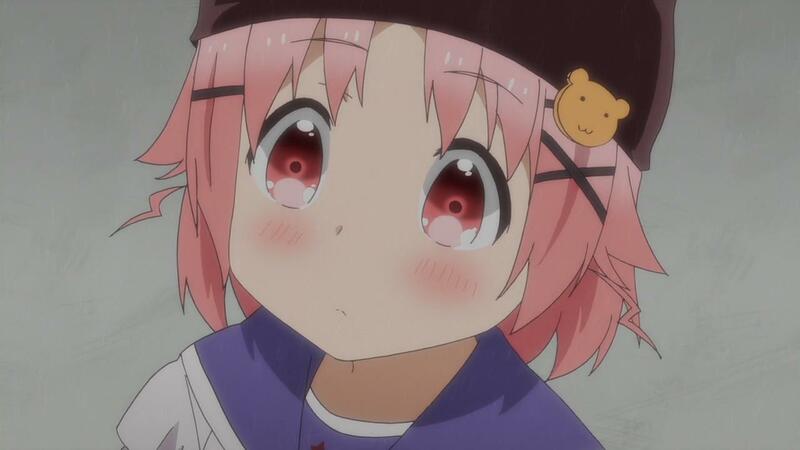 The difference is, of course, the moe factor: the characters are cute, I want to see them live and do cute things, I do not want to see them suffer. These preferences are extremely emotionally charged. The way the show almost functions as a regular slice of life is especially excruciating for fans of the genre. The titular School Live club's activities are a bleak mirror of a typical show's, but the added intimacy of wholly shared domestic lives makes it even more precious. 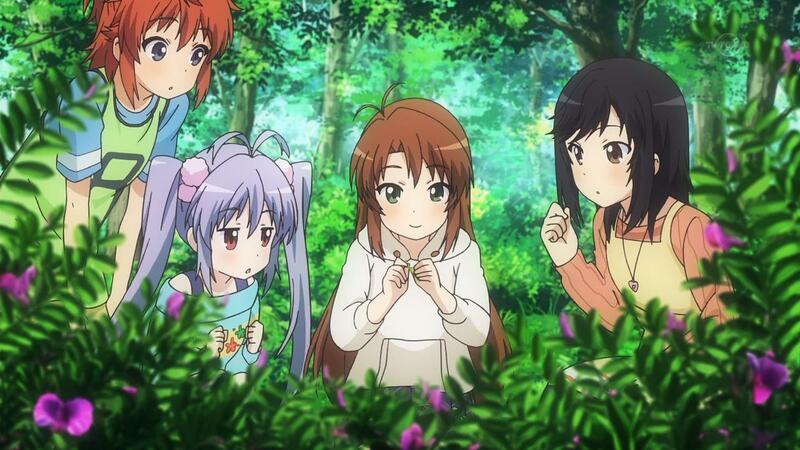 Like Non Non Biyori, there's a coziness that springs from having a total understanding of the environment of the show, but, unlike the idyllic countryside, the circumstances of their isolation are dire. You find yourself longing for the show to switch genres, to become a typical tranquil slice of life, to return to a known and familiar state. In this desire you are wholly united with the characters. The point that unites these two worlds is the delusions of Yuki-chan, our hapless but happy focal character, who still believes that everything is a-okay. 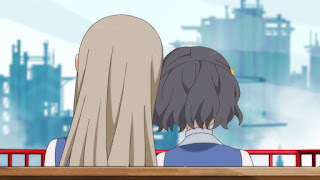 It is from the disconnect between her understanding of the situation and the reality that drives the series' many "twists", but beyond these reveals is the constant tension provided by the duality... You find yourself evaluating every scene both as how it's really happening, and how Yuki must be seeing it, experiencing alternatingly the satisfaction of everything "lining up" and the horror of foreseeing disconnects. One particularly chilling scene, where Yuki cannot figure out how they all fit in the car back from the mall, will stick with me forever. My feelings towards the future of the series are mixed. As we move past the original premise and into grander conspiracies, survival outside of school, and an expanded cast, I worry that the fundamental duality of slice of life/zombie survival might be lost. Sure, the idea of a grand adventure that returns them to happy normalcy might be extremely satisfying, but the somewhat underwhelming resolution in the final episode has me doubting. Still, even if they completely flop from this point on, they've crafted a compelling, unique experience, with lovable characters and powerful atmosphere. Okay if you've used any sort of "young people" meme social internet media culture trash, you'll recognize this, the crossover hit of the year. 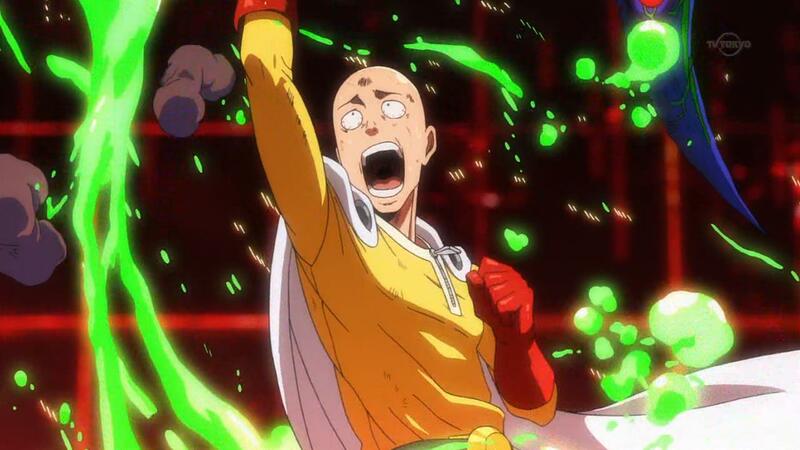 If instead you have been doing healthy things in your sub-rock home, I'll give you a quick rundown: One Punch Man is the story of Saitama, a hobbyist hero that has trained so hard, and become so ludicrously powerful, that he wins every fight in a single punch. It started as a goofy webcomic parodying shonen and superhero series, but ONE's imaginative worldbuilding and 100% homerun character design quickly expanded it into an excellent shonen series on its own right. The webcomic was remade by shonen veteran artist Yusuke Murata, who 180'd the joke of ONE's minimal doodles into gorgeous dynamic richly detailed art that was cinematic even in stillness. It was this that was adapted into the anime, and all I really need to say is that it did it justice. Otherwise the scrollbar gets too small and when people load it they go "well screw that".